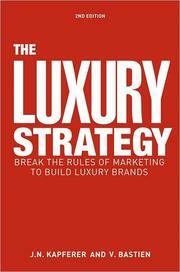 The Luxury Strategy is the definitive work on the essence of a luxury brand strategy. It puts an end to the confusion around the term, and explains the fundamental differences between 'premium', 'fashion', and 'luxury' strategies. Based on an analysis of the social functions of luxury, of worldwide best practices and on first hand direct experience, it sets out the rules for success, and turns established marketing rules upside down. The Luxury Strategy provides the first rigorous blueprint for the effective management of luxury brands and companies at the highest level, including human resources and financial management. It also unveils the original methods that were used to transform small family businesses such as Ferrari, Cartier, Chanel, Gucci, and Ralph Lauren into profitable global brands.